Kid Inventors: An Educational Comic Book! KidInventor Production located in Silicon Valley has recently proudly announced the launch of their first book in the upcoming comic series called Kid Inventors: Wonderworld Fantasies at a crowdfunding campaign on Kickstarter. The book series will inspire creativity and innovation in children and teens like never before with an aim to keep learning as interesting and fun as possible. The Kid Inventors project is a production of comics and episodic animation movie series produced by KidInventor production, and this comic book is the one of the productions. 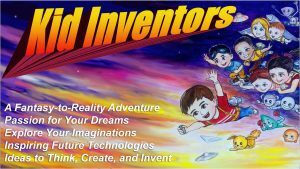 Kid Inventors story is about an adventure of a group of kids who have great passion to invent, and how they fight with challenges and obstacles. It’s a fantasy-to-reality story and its primary mission is to inspire youngsters to learn and create things and bring their natural ideas to reality. The story will play a major role in enabling today’s children and teen to explore their imaginations and dreams. Furthermore, the series will motivate youngers to learn science and technology, and start experimenting at a young age to explore the heights of their imagination. “The mission of Kid Inventor comics and their affiliated productions is to encourage curiosity, learning desire, creativity, teamwork, leadership, and community contribution for today’s young people.” According to the author, the mission of Kid Inventors productions is to create new geniuses, who will grow up to become the next Steve Jobs, Nikola Tesla, Thomas Edison, Albert Einstein, Bill Gates, and Elon Musk, etc. All supporters from around the world will become a part of this inspiring project! Black Friday Sale! Free Shipping!! Happy Holidays!! !